India reformed on the back of a crisis in 1991 and over the last 25 years has made considerable progress. The GDP of Maharashtra today is higher than India’s GDP in 1991. Life expectancy has increased by 10 years. Poverty (relative and absolute) has declined. But India is not meeting its full potential and its demographic dividend risks becoming a disaster. There are also worrying signs – of rising protectionism – on the international trade front. Is India on the verge of another 25 years of rapid growth or are we overly pre-occupied with headline growth numbers of our GDP while our underlying fundamentals remain weak? Inadequate spending on education, health, high levels of corruption, and weakened financial system and institutions threaten the future. India’s rankings on global competitiveness indices and the World Bank’s ease of doing business have improved but India’s external deficits have risen to dangerous levels again. Exports have been tepid and imports have surged. India has reacted by increasing import tariffs on a range of commodities to contain the deficit – but this may produce short-term gains at the cost of long-term competitiveness. India is at cross-roads and the stakes are high. If India reverses further on its reforms, several experts have warned of growth slowing down. A drop to the so-called ‘Hindu growth rate’, coined by Prof Raj Krishna, of 4 per cent will take us only up to $4.3 trillion in GDP by 2030 – behind Japan. At the same time bold reforms in land, labour and capital markets could accelerate our growth to 9 per cent per annum which will make India a $9 trillion economy by 2030 (third largest after USA and China). The current 6-7 per cent will take us to $6-7 trillion. The issue of jobs and competitiveness is inter-related. If India intends to be a competitive economy in global markets it should be able to ‘Make in India’ for both the domestic market (import less) and for the global market (export more). Growth based on competitiveness should also lead to more jobs. The most recent Global Competitiveness Index of the World Economic Forum for 2018 ranks India 58th out of 140 countries. This appears impressive at first glance but India’s rank is lifted up hugely by its market size. If India was an average-sized country, its rank would drop closer to 70th, similar to Sri Lanka or Vietnam. The IMD competitiveness index, which does not include market size as a factor in its rankings, places India at 44th position out of 63 countries. Unpacking these indices reveals a number of areas where India needs to focus in a coordinated manner. The WEF Global Competitiveness Index reveals areas where India lags behind. Among the institutional factors, the WEF Competitiveness index identifies issues of quality of land administration and regulatory capacity. It also notes infrastructure, logistics, electricity connectivity and transmission as areas of focus. Health and education figure prominently in the weaknesses identified by the index. These include low average years of schooling, low pupil-teacher ratio, and deficiencies in higher education, and the lack of safe drinking water. A surprising weakness identified by the WEF index is Information and Communications technology (ICT) adoption. High trade tariffs and service trade openness are also given low scores. Labour markets are identified as a major drawback for India, with high labour tax rates, restrictions in hiring and firing and low female participation rates. The financial sector with high NPLs and regulatory capital ratios are included as weaknesses, despite the Insolvency and Bankruptcy Code. India also has the highest financial intermediation costs in the world and despite Jan Dhan financial inclusion remains very low. Though there have been improvements in India’s rank from 133 to 100 and to 77 in 2018 in the World Bank’s ease of doing business index, the time it takes to start a business, the costs of running a business and exit, the insolvency regulatory framework and trademark applications are highlighted for low scores. These are some of the areas where improvement would require coordinated efforts across several government layers and necessitate legal and procedural changes which would be complex. The IMD index has many similarities to the WEF index: training and education, regulatory framework, technological framework, IT integration and adaptive attitudes are identified as low scorers. It also highlights city management (municipalities) and R&D per capita as additional important weaknesses. Despite progress, it identifies the need for improvement in e-government, smartphone and tablet access. It also places huge emphasis on greater public expenditure on education, higher education and women’s education. These global indices of India’s competitiveness complement domestic business surveys which have identified many of these weaknesses, all of which hinder ‘Make in India’, and lead to insufficient employment for people. How much employment is actually being generated remains an area of considerable dispute and controversy. India’s working age population will increase by around 12 million per year until 2030. India has a high labour force participation (LFP) rate for men, around 0.8 but very low for women – under 0.27. Surprisingly the rate for women has been falling and more and more women are dropping out of the labor force. With an average LFP rate of 0.5-0.55, India will need to create 6-6.5 million jobs until 2030. India has been creating employment for about 5-5.5 million people every year. This means, every year one million new entrants seeking employment cannot find productive work. Another one million jobs per year is needed to absorb some of the people who could not find suitable work over the last decade or so. If India is to make full use of the female labour force, their LFP rate must rise to at least 0.5 which would make the average rate above 0.65. Adding it all up will mean India must increase employment by 8.5-9 million people per year until 2030. India has been creating 750,000 jobs for every one per cent GDP growth. So to create 8.5-9 m of employment would require a GDP growth of 12 per cent per annum – a tall order for India to achieve. Alternatively, if India could create a million jobs for every GDP growth even 8.5-9 per cent, GDP growth would be enough to realise India’s demographic dividend. This is an achievable goal over the next 10-15 years even in the difficult global environment. Improving India’s competitiveness and creating more employment intensive growth is not rocket science. As India’s competitiveness and job surveys show, a waterfront of issues must be covered. 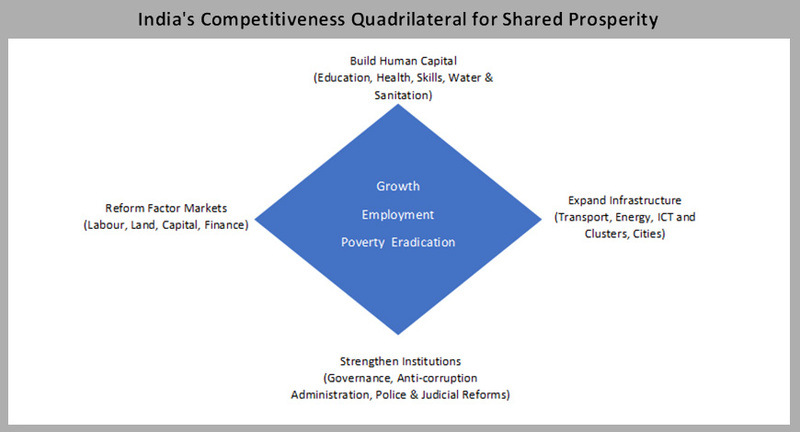 These can be summarized into a competitiveness quadrilateral for shared prosperity as seen in this picture; and these can be clubbed into four broad areas of emphasis: build human capital, expand infrastructure, reform factor markets and strengthen institutions. Education, health and sanitation must be given the highest priority, with increase in public spend on these to 9% of GDP – 3% for health and sanitation and 6% for education. Agriculture must be modernized, with markets freed up and direct income subsidies; a new strategic trade and industrial policy must be followed to take into global value chains and travel, tourism and mobility services provide a low hanging fruit for job creation. Labour reforms and fixing the financial system must be given the most urgent attention. India has grown relatively rapidly, at around seven per cent, but it has lost a decade on the employment front. If it does not get its act together and reverses – it risks social strife and even an “Arab Spring”. It must also address huge gender disparities and create more opportunities and an innovative business culture. Moreover, actions must be taken at both the centre and in the states in a spirit of ‘cooperative federalism’ now enhanced by the work of the GST Council. It will become the third largest economy by 2030 – an economic superpower but also a happier country if its growth is inclusive and creates decent livelihood for 1.5 billion plus citizens.